Xander and her friends onboard the bounty hunter ship, Prodigal, risk their lives to recover the derelict spaceship that could restore the shattered pieces of her memory. No one realizes what that decision will cost them. A ruthless enemy. A shocking secret. An impossible choice. A ruthless syndicate is determined to capture Xander by any means necessary. For protection, she turns to top Prodigal hunter and former assassin Kale Ravenwood, but as their relationship heats up, so does the syndicate threat. The closer they grow to each other, the more danger they face, for Xander can’t remember enough, and Kale remembers far too much. 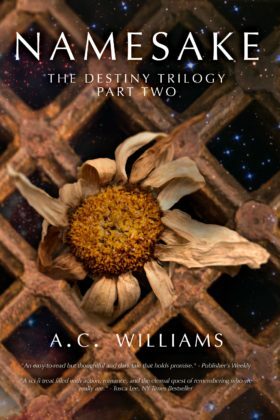 Xander’s search for her memories leads her across the solar system, only to discover the unbelievable secret of the Destiny Project. When Xander learns the truth of her identity and origins, she must choose between the comfort of her former life and the new, dangerous life she has come to know and love. Either choice means sacrifice. What would she rather give up—her friends or her name? Book 2 of the Morningstar series.